I am a fan of water base makeup remover. From my very very old post back in the years I can really tell that water base makeup remover never fail me. I love the non sticky feeling and fresh feeling after removing makeup. Its like swiping wet cotton pad (like damp water cotton) over your face without the oil feeling or irritating feeling when it gets into your eyeball. Ugh. I hate when that happens. It is a water-based Makeup Remover that has high cleansing abilities but still gentle for all skin types. I don't know that this product is coming out until I was looking for the Biore Makeup Remover in sheet and then I saw this. I was like, water base? I'm so buying it! So I grabbed it. 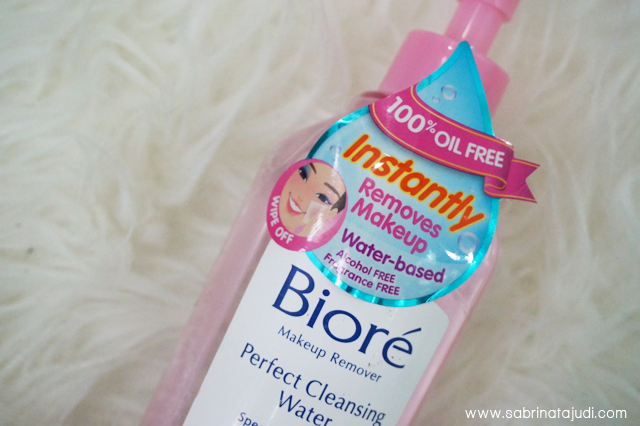 In Singapore it is called Bioré Micellar Cleansing Water. They look the same, but I am not sure if they are the same with just different names. This makeup remover is said to formulated with Japan's Natural Mineral Water. Been using it ever since and feel in love from the first try. It is easy to use, feels gentle on the skin, refreshing and does not irritate or sting my eyes even if its gets in. It's like washing your face with water but all of your makeup even with your waterproof makeup just swipe away like magic.It is also formulated with no Alcohol, oil, fragrance and colorant. I totally recommend you to try this. i think it suits all skin types and I think everyone is going to love this. It is not oily, dry out and irritate your eyes. Price wise are also reasonable. It comes with a cute pink pump bottle. Super convenient. Where To Buy : Major Pharmacies that carries Biore products. What is your favorite type of makeup remover? I never tried cleansing cream. Sound ncie! Wow , with one wipe ? hahhaa baru smlm pegang this product, nak beli ke tidak. tapi mengenangkan cleansing oil biore pon masih banyak, so lupakan dulu. dah abis baru nak beli yang ini!!! Haha, sab xleh yg cleansing oil tu. pedih mata! yep for sure! it perfectly for it. this does not comes in travel size. maybe you can purchase like a small spray bottle and bring this anywhere. spritz some on a cotton pad or tissue and swipe away! does not leaves any greasy feeling.